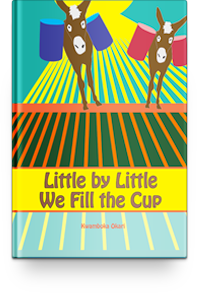 Little by Little is a chapbook of poetry written by children at the Margaret Okari School in Kisii, Kenya along with children in the United States and United Kingdom, the first in a new series of books the Margaret Okari Children’s Foundation plans to publish annually about different themes relative to their lives. Our first theme is water, and this book celebrates the groundbreaking of a new clean-water well at the school, generously funded by the Rotary Club of Andover, MA, along with partnering Rotary Clubs. When the well is finished the children and staff will save hours each day spent walking to collect and bring back water. The hard-working donkeys at Okari have become emblematic of our efforts to keep the children in school. Fundraising has enabled us to hire them. With them tasked to get the water, it relieves the time, physical burden, and safety issues associated with children having to fetch the water. With every trip the donkeys take to the water, the children—generally females in the African culture; though the children at Okari share this task—also get to remain in the classroom. While we are happy that this has alleviated some of the challenges around water—it has not resolved them all. Children still fetch water—and that water is not necessarily clean. We are thrilled to announce that construction of a new, clean-water well is slated to begin in the summer of 2015. 100% of the profits from sale of this book fund education for the children at the school, including a STEAM (Science, Technology, Engineering, Arts, and Mathematics) initiative launching in 2015. Because of the contributions of time and talent from the poets, painters, children, and adults alike, and special funding from one of our generous donors, 100% of the profits from the sale of these books will fund operations and arts programs at the school. Books can be purchased for $15 US using our PayPal system. Purchase by clicking the BUY NOW button below. Alternatively, you can also send an email to Peg Campbell to arrange for purchase and shipping of the book, or multiple books. Little by Little makes an excellent gift for individuals, or even classrooms. For book orders of more than 10 books, please also contactPeg for progressive discounts. 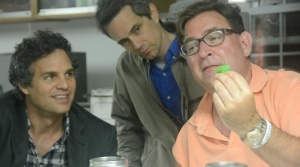 Mark Ruffalo, John Pratt, and Scott Smith (left to right) of Water Defense work tirelessly to advocate for clean water across the globe. Ruffalo recently received the Britannia Humanitarian Award for his work with Water Defense, for keeping waterways and drinking water sources free from contamination and industrial degradation. The award is presented to a person who has used the art forms of the moving image and/or their position in the entertainment industry to create positive social change and actively shine a light on important humanitarian issues that need global attention. They’ve generously offered to test the well to ensure the safety of the water for the children and the surrounding community. We are grateful for that—and all they are doing to advocate for clean water around the world. Join us in supporting them back!